is a unique encounter, he is on a so-called random spawn timer. While not one of the most dangerous mobs on Rubi-Ka, his life is still usually quite brief since many players seek to take him down. 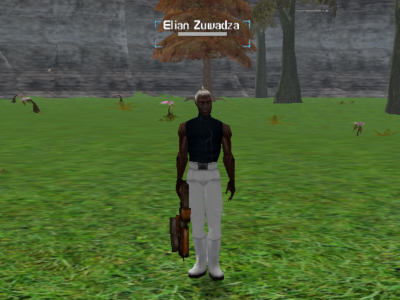 A level 150+ player can solo him, but since Elian's spot is frequently checked, such a player might get outdamaged by competition. Elian hits for 600-800. It is located in Galway Shire (420,1255) and it is level 110. No special tactics are needed to kill him. Standing in proximity of a player city, there is a slight possibility of high level aliens wandering around however. There is tower base on the other side, but due to it being low level one, there shouldn't be any problems. None of his loot is 100% drop. So you can kill him and get empty loot. The Blackshirt has a higher droprate than the other two items.